Physicians who perform LASIK like to boast about the number of so-called 'successful' LASIK surgeries they have performed, but they don't want to talk about their LASIK disasters. Here you can read about some of the 'unsuccessful' cases that otherwise would never have come to light. LASIK surgeons like to claim that if you don't achieve the surgical outcome you expected, you can always have an 'enhancement' (second surgery) to 'fine tune' your results. But we've heard from hundreds of patients whose vision continued to deteriorate with every subsequent surgery. We call this the domino effect of unnecessary eye surgery. Problems from LASIK? File a MedWatch report with the FDA. Read a sample of LASIK MedWatch reports currently on file with the FDA. Images on this page courtesy of Dr. Edward Boshnick. 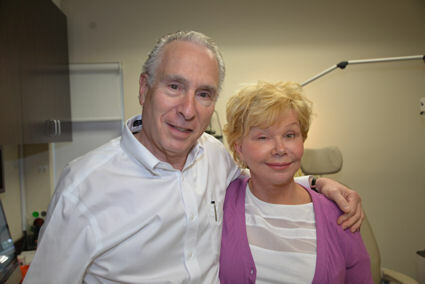 Dr. Boshnick has devoted his practice to the restoration of comfort and quality vision after LASIK and other forms of refractive eye surgery. The woman in the photo below underwent LASIK surgery in 2006. About a year later she developed post-LASIK ectasia in both eyes. In 2008, in an effort to correct her distorted corneas, she underwent another refractive surgical procedure known as CK (conductive keratoplasty). 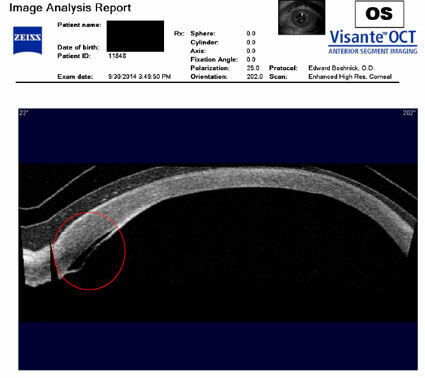 In March, 2014 the right corneal LASIK flap became dislodged and her cornea perforated. A emergency corneal transplant was performed to restore vision. 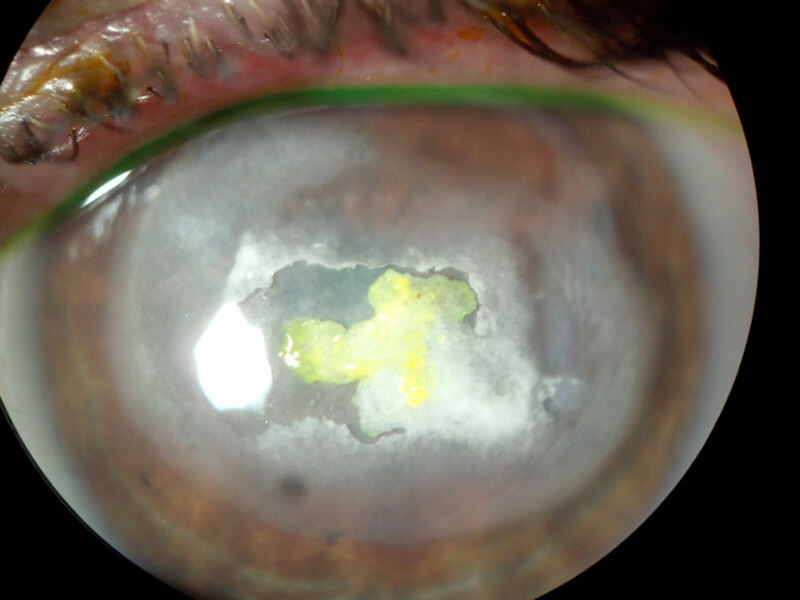 To prevent rejection of the corneal transplant she was placed on steroid drops which caused a sharp spike in the intraocular pressure of her right eye to over 50 mm Hg. To bring the pressure down a shunt was surgically placed into her eye. Although her intraocular pressure was reduced to a normal level, irreversible damage was done to her optic nerve. She is now blind in her right eye. This case is an example of what we refer to as the domino effect of unnecessary refractive surgery. The image below is a scan of the eye of a patient who underwent RK surgery in the 1980’s followed by LASIK surgery in 2003. In 2014, the patient suddenly lost vision in her left eye due to corneal ectasia. The intraocular pressure pushing outward against a thinned, weakened corneal wall caused the innermost corneal membrane (Descemet’s membrane) to tear. In this optical coherence tomography (OCT) image, you can see the torn membrane circled in red. When this tear occured, aqueous from within the eye entered the cornea causing the cornea to become hazy and the vision in this eye to become very blurry. This condition is known as “hydrops”. You will note that above the cornea there is a scleral lens represented by two fine semi-parallel lines. The purpose of the scleral lens is to provide vision and to protect the compromised corneal tissue. 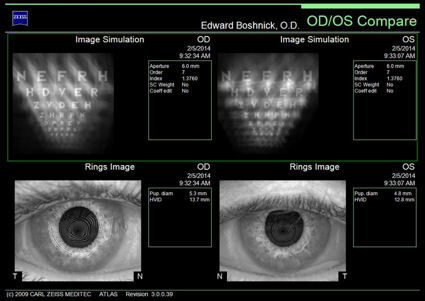 The image below-left is a 3-dimensional view of a LASIK patient's right cornea. This patient had -18 diopters of myopia prior to undergoing LASIK. After surgery he developed corneal ectasia. 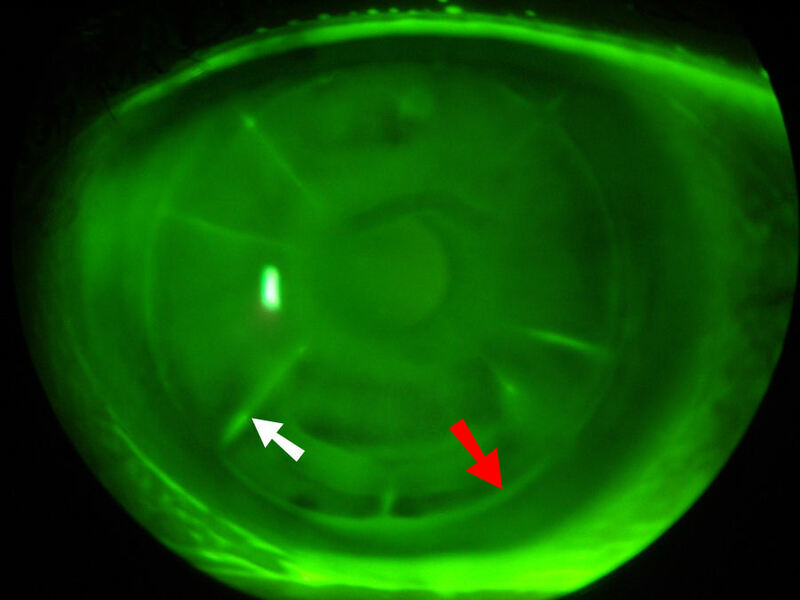 The image below-right is a healthy unoperated cornea for comparison. The patient's vision can only be corrected to 20/40 with expensive, specialty hard contact lenses. Without lenses, the patient cannot function. Sadly, this patient also developed glaucoma in both eyes. As a result of vision loss from this needless surgery, the patient lost his job. Shortly thereafter his wife filed for divorce. He is currently unemployed, and struggling just to pay for his eye care. The image below illustrates the visual distortions of a patient who originally underwent RK surgery for 10 diopters of myopia. After the first surgery failed, the patient had an additional RK surgery followed by 2 LASIK surgeries in each eye. 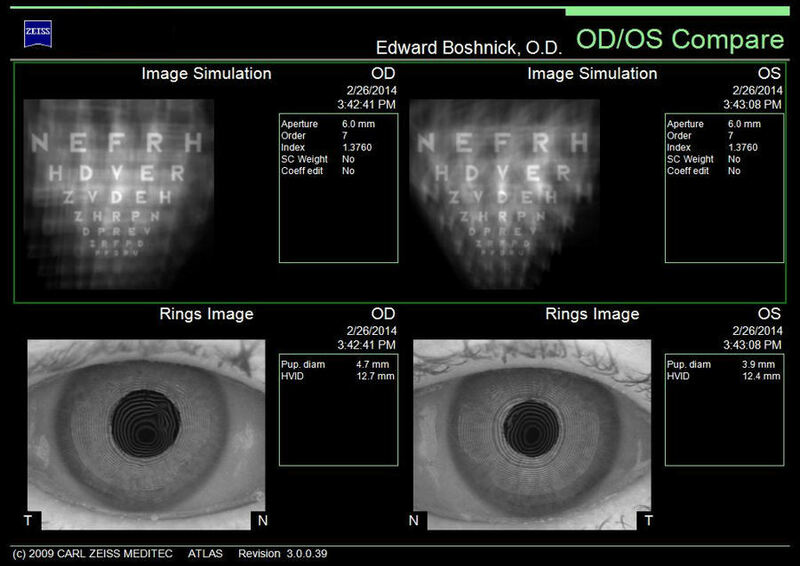 The "Image Simulation" (upper portion of image) illustrates how the patient sees the eye chart. The "Rings Image" (lower portion) depicts how rays of light deviate from perfectly round concentric rings, as you would see in a normal eye. Click image to enlarge. 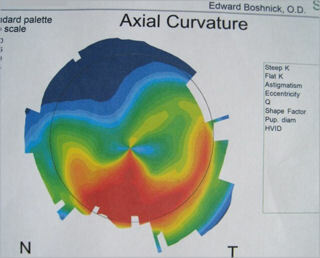 The image below illustrates the severely distorted vision of a patient who had LASIK in 2001. Two years later he developed corneal ectasia and was abandoned by his surgeon. Without specialty hard contact lenses, this patient cannot function. Click image to enlarge. 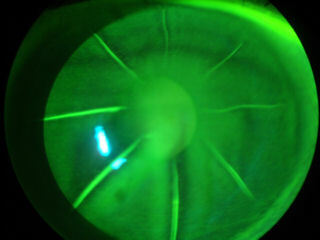 The photo below is the eye of a patient who had LASIK surgery in 2004. She developed ectasia a couple of years later, which led to need for corneal transplant. She underwent multiple corneal transplants, all of which rejected. The latest transplant resulted in CALCIFIC BAND KERATOPATHY. The patient has refused further surgeries. Click on photo to enlarge. 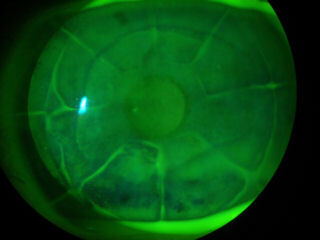 The photo below is the eye of a patient who had LASIK in 2003. 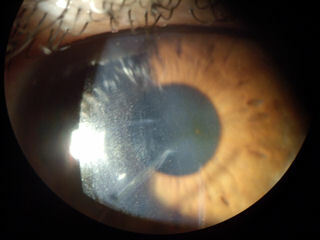 The LASIK flap edge can still be seen in this 2012 photo, demonstrating the flap's inability to heal. The patient has dry eye disease, which is seen as dry spots of staining on the cornea. 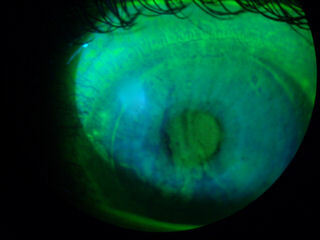 (A special light is used to illuminate damaged tissue after green dye is instilled into the eye). The small, poorly-defined oval or circular areas just below the LASIK flap between 11:00 and 1:00 is epithelial ingrowth. The patient also has post-LASIK ectasia. Click photo to enlarge. 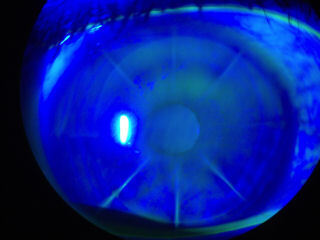 The photo below is the eye of a patient who had 2 RK surgeries followed by 2 LASIK surgeries. Repeat LASIK surgeries led to epithelial ingrowth, which required 2 additional flap lift surgeries. The patient subsequently developed traumatic cataract, which led to need for cataract surgery. This case is an example of the "domino effect" of unnecessary eye surgeries. Click photo to enlarge. 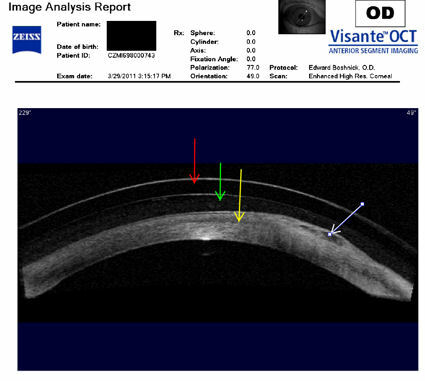 The three images below show an eye 22 years after radial keratotomy (RK) surgery. It is well-documented that the cornea is incapable of complete healing -- instead, scar tissue is formed in response to injury, which is visible in these photos. The surgeon made the RK incisions so long that they extend into the patient's line of sight, creating blur and visual distortions. 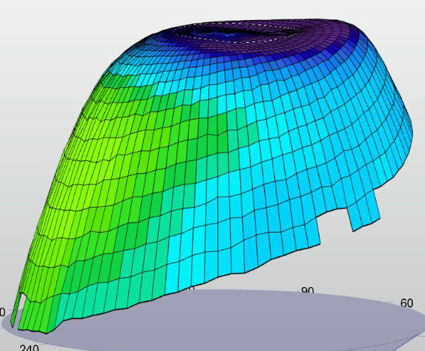 The patient's vision cannot be corrected even with specialty hard lenses. The second image in the series is a photo which was taken after green dye was instilled into the eye. The dye settled into the still-open unhealed RK incisions. 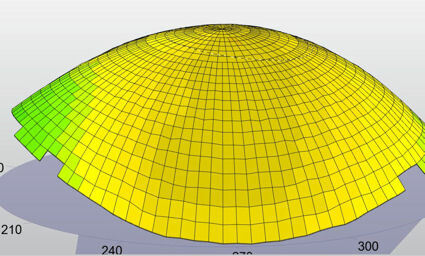 The third image is a topography of the cornea, which shows the highly irregular shape of the corneal surface (induced irregular astigmatism). Click on images to enlarge. The eye in the photo below was treated with conductive keratoplasty (CK) in an attempt to correct the patient's vision after LASIK overcorrection. The patient had excellent vision with glasses before these surgeries. Now the patient has extremely blurry and distorted vision, which is not correctable with glasses. Click photo to enlarge. CK was introduced to treat farsightedness. CK uses a needle-like probe to deliver radio-frequency energy (heat) to the peripheral corneal collagen in a ring of individually placed spots. Heat causes the corneal collagen to shrink, resulting in steepening of the central cornea. Below, you can clearly see eight spots or dots in a ring around the cornea where the CK probes were inserted. The red arrow points to one of the CK spots. Just outside the ring of CK spots is the LASIK flap edge, indicated by a white arrow. These injuries to the cornea never fully heal. 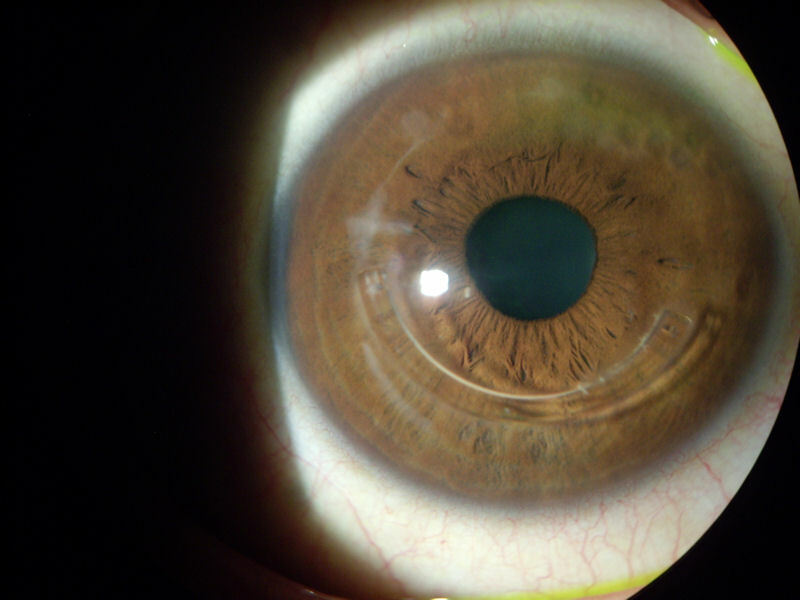 The photo below shows the eye of a patient who had RK (radial keratotomy) in 1988 followed fifteen years later by LASIK in 2003. The white arrow points to one of the non-healed RK incisions (radial lines). The red arrow points to the edge of the LASIK flap which has not healed. The patient's vision is very distorted. Click photo to enlarge. The photo below shows severe dry eyes in a patient who had LASIK followed by PRK. The red arrow points to the LASIK flap margin. Green dye has been instilled in the eye, which highlights areas of surface disease and loss of surface cells (epithelium). 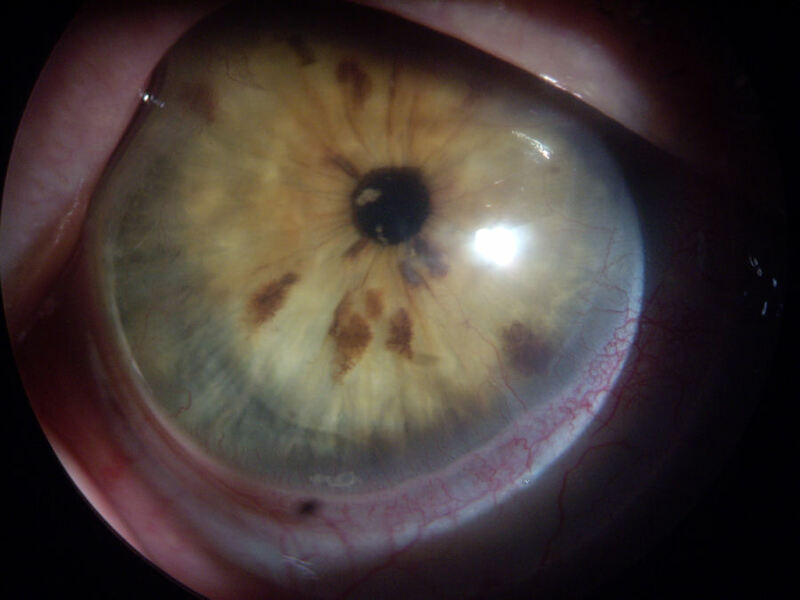 The white arrow in this photo points to a large dry area of the cornea which appears as a cluster of spots. Click photo to enlarge. 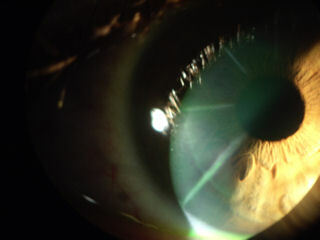 The four images below are photos of the eye of a patient who had Radial Keratotomy (RK) surgery followed later by LASIK. The damage left by these unnecessary surgeries led to a corneal transplant. 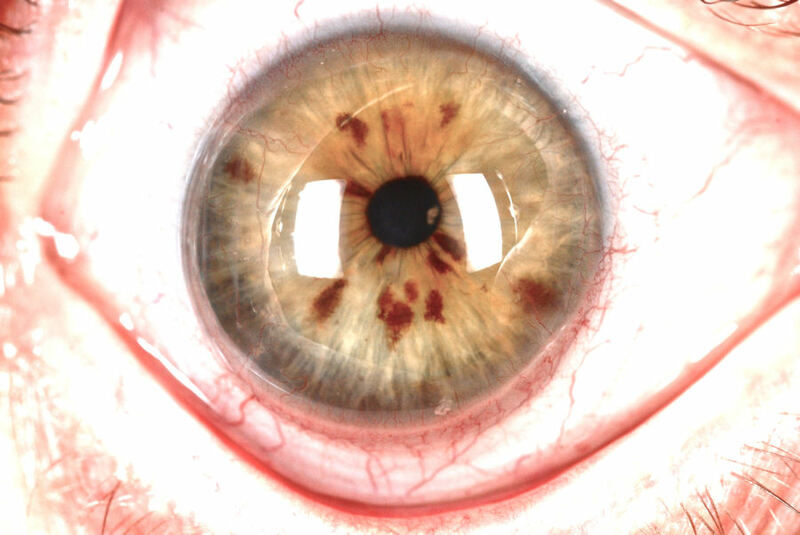 Note numerous blood vessels growing deep into the cornea. A healthy cornea has no blood vessels. This sight-threatening condition is called corneal neovascularization. If you look closely, you can see scars from the RK surgery. Blood vessels have traveled into the cornea along these scars. Click photos to enlarge. The image below-left is another photo of the same eye taken with a different camera. You can see well defined blood vessels throughout the cornea. The edge of the transplanted tissue is obvious in these images. 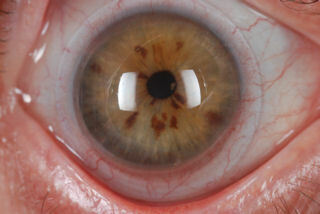 (The patient is wearing a large diameter hard contact lens, which can be seen on the white of the eye.) Below-right is the same photo which has been edited to highlight the blood vessels and transplant margin. Click to enlarge. This patient's story is an example of the domino effect of unnecessary eye surgery. She had RK surgery in the mid 90's. Sometime later her vision started to deteriorate, but glasses could not correct the irregular astigmatism caused by RK. So the patient consented to undergo LASIK, which didn't help and led to corneal ectasia. The two images below are the same eye under different illumination. The patient had RK surgery in 1990. His vision deteriorated, and he was advised to have LASIK in 2001. Within one year of having LASIK surgery, the patient developed corneal ectasia. Note that the RK incisions are still open after all these years, and will likely remain open for the rest of his life. The photo below is a post-LASIK cornea with epithelial ingrowth, ectasia, and INTACS. The patient had LASIK surgery in 2005. Several years later he developed ectasia and began losing vision in his right eye. In 2008 he underwent two separate procedures to treat ectasia -- corneal collagen cross-linking and implantation of a plastic insert called INTACS. 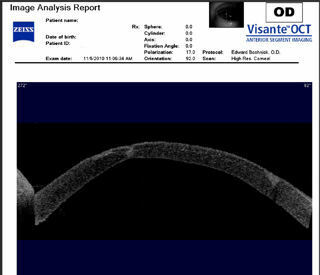 The foreign object located in the perimeter of the cornea is the INTACS. 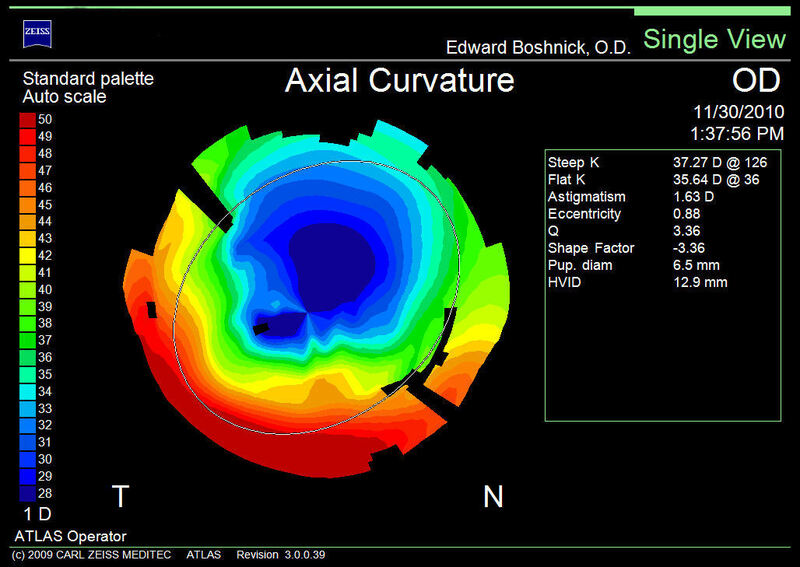 INTACS are designed to flatten corneal protrusion. Unfortunately, these procedures were not successful in restoring the patient's visual quality and clarity. 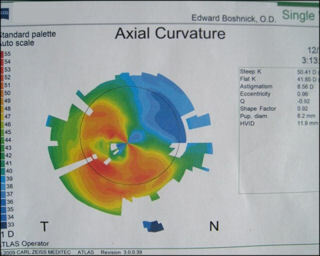 His best corrected vision with eyeglasses in his right eye is 20/40 with halos, glare, and double vision. The patient is currently wearing therapeutic hard contact lenses. The milky line running from 7:00 to 8:00 is epithelial ingrowth. The t-shaped hazy white scar at the 9:00 position is from the incision which was made to insert the INTACS into the cornea. The image below is an OCT cross sectional scan of an eye with post-LASIK bullous keratopathy. The patient is wearing a scleral contact lens. Bullous keratopathy is a condition in which the cornea becomes permanently swollen secondary to damage to the innermost layer of the cornea, the endothelium. The endothelium acts as a pump, removing fluid from the cornea to maintain its clarity. 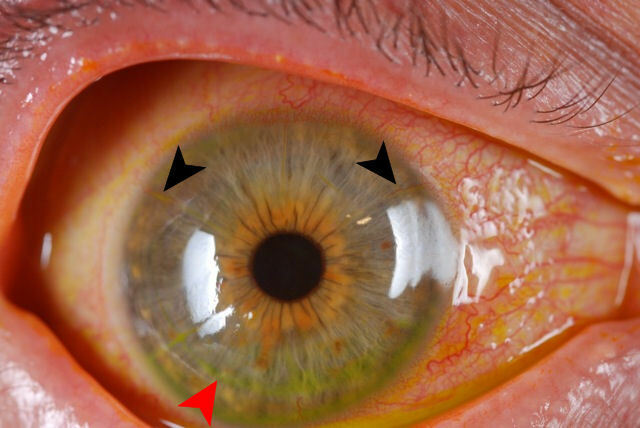 The red arrow points to the scleral lens. 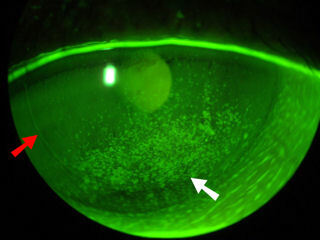 The green arrow points to the space between the lens and the cornea which is filled with saline or tears. The yellow arrow points to the cornea. The far right arrow points to the area of bullous keratopathy. 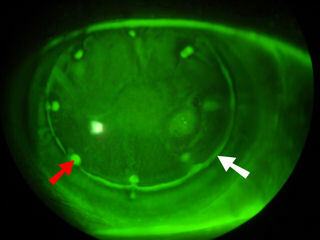 The two images below are the left and right eye of a patient who had two separate RK surgeries in each eye in 1992, followed by LASIK in 2002. These photos were taken through a slit lamp (bio-microscope) after applying fluorescein stain on the eye. A blue light is used to illuminate areas of staining, which indicate damage to the cornea. Note the RK incisions and LASIK flap margin are staining green-yellow, revealing open wounds. The next two images are topographies of the left and right eye of the same patient. The wide range of colors represent significant irregular astigmatism and wildly changing refractive power across the central cornea, which is indicative of very poor visual quality. The patient developed ectasia as a result of these surgeries. Ectasia occurs when the cornea is too weak to maintain its shape, and bulges forward (steepens). This condition creates severe visual distortions, and often requires corneal transplantation. The two surgeons who performed these surgeries and the doctor who referred this patient for these surgeries misdiagnosed post-LASIK corneal ectasia as keratoconus. Keratoconus is genetic disorder of the cornea which usually presents during a patient's teen years, progresses over the next decade or so, and generally affects both eyes. 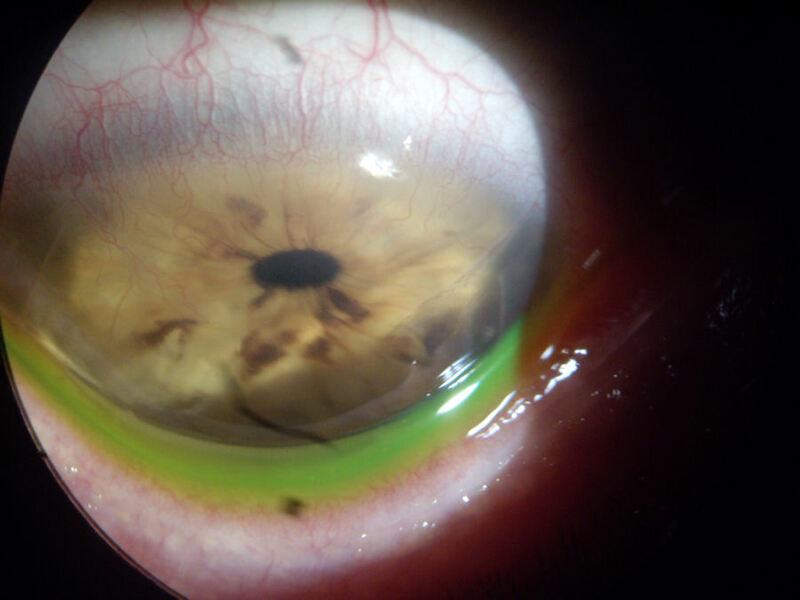 Ectasia after refractive surgery is a direct result of surgical weakening of the cornea. The symptoms of keratoconus and ectasia are similar -- severely distorted vision which cannot be corrected with glasses. The misdiagnoses were likely an effort to thwarth legal action against the doctors responsible for this ocular disaster. The patient has undergone an experimental procedure known as corneal collagen crosslinking in an attempt to halt the progression of ectasia. The procedure involves placing riboflavin on the ocular surface followed by exposure to ultraviolet light to stiffen the cornea. Unfortunately, even when this procedure is "successful" at halting progression of the disease, it does not restore visual quality to pre-surgical levels. The next step for this patient is being fit with hard lenses. The four images below are photos and scans of the right eye of a patient who underwent two RK surgeries and two LASIK surgeries, and subsequently developed ectasia, neovascularization, and staph infection. (All four images can be enlarged by clicking on the image.) In the top-left photo, the red arrowhead points to the LASIK flap, which never fully heals. The two black arrowheads point to open RK incisions where blood vessels are encroaching into the cornea (neovascularization). This is a sight-threatening situation. The eye is red and blood-shot as a result of the staph infection. The following 3 images are cross-sectional scans of the cornea, which exhibit damage from RK incisions and thinning associated with ectasia. This case demonstrates the domino effect of unnecessary eye surgery.